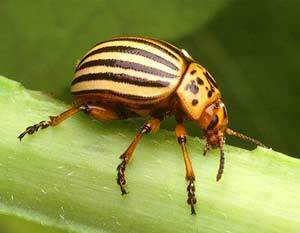 The Colorado potato beetle is a plump yellow beetle with black stripes over its wings and black spots just behind its head. The humpbacked larva is red with a row of black spots along each side. Both feed on potatoes, eggplants, ground cherries, peppers, tomatoes, and tomatillos. Colorado potato beetles prefer cold winters. They range across most of the United States but are most common in the east. Adult beetles overwinter in the soil, emerging in the spring to lay clusters of yellow eggs on the undersides of leaves. Depending on the climate, there can be up to three generations per year. A thick organic mulch makes it hard for emerging beetles to reach plants in spring. Surveillance and hand picking remain among the gardener's best defenses. Knock any beetles and larvae you find into a can of soapy water to dispose of them. Natural enemies include birds, spined soldier bugs, and parasitic nematodes. Spray Bacillus thuringiensis tenebrionis (also known as Bt San Diego) while larvae are small to manage major outbreaks.